In astronomy, precovery (short for pre-discovery recovery) is the process of finding the image of an object in old archived images or photographic plates for the purpose of calculating a more accurate orbit. This happens most often with minor planets, but sometimes a comet, a dwarf planet, a natural satellite, or a star is found in old archived images; even exoplanet precovery observations have been obtained. While the term "precovery" refers to a pre-discovery image, "recovery" refers to imaging of a body which was lost to our view (as behind the Sun), but is now visible again (also see Lost minor planets and Lost comets). Orbit determination involves measuring its position on multiple occasions. The more widely separated these are in time, the more accurately the orbit can be calculated. However, for a newly discovered object, only a few days' or weeks' worth of measured positions may be available, which is only sufficient for a preliminary (imprecise) orbit calculation. When an object is of particular interest (such as asteroids with a chance of impacting Earth), researchers begin a search for precovery images. Using the preliminary orbit calculation to predict where the object might appear on old archival images, those images (sometimes decades old) are searched to see if it had been in fact photographed already. If so, a far longer observation arc can allow a far more precise orbital calculation. Until fast computers were widely available, it was impractical to analyze and measure images for possible minor planet discoveries because this involved a considerable amount of manual labor. Usually, such images were made years or decades earlier for other purposes (studies of galaxies, etc. ), and it was not worth the time it took to look for precovery images of ordinary asteroids. Today, computers can easily analyze digital astronomical images and compare them to star catalogs containing up to a billion or so star positions to see if one of the "stars" is actually a precovery image of the newly discovered object. This technique has been used since the mid-1990s to determine the orbits of an enormous number of minor planets. In an extreme case of precovery, an object was discovered on December 31, 2000, designated 2000 YK66, and a near-Earth orbit was calculated. Precovery revealed that it had previously been discovered on February 23, 1950 and given the provisional designation 1950 DA, and then been lost for half a century. The exceptionally long observation period allowed an unusually precise orbit calculation, and the asteroid was determined to have a small chance of colliding with the Earth. After an asteroid's orbit is calculated with sufficient precision, it can be assigned a number (in this case, (29075) 1950 DA). The asteroid 69230 Hermes was found in 2003 and numbered, but was found to be a discovery from 1937 which had even been named, but subsequently lost. Consequently, its old name "Hermes" has been applied to it. Centaur 2060 Chiron was discovered in 1977, and precovery images from 1895 have been located. Another extreme case of precovery concerns Neptune. Galileo observed Neptune on both December 28, 1612 and January 27, 1613, when it was in a portion of its orbit where it was nearly directly behind Jupiter as seen from Earth. Because Neptune moves very slowly and is very faint relative to other known planets of that time, Galileo mistook it for a fixed star, leaving the planet undiscovered until 1846. He did note that the "star" Neptune did seem to move, noting that between his two observations its apparent distance from another star had changed. However, unlike photographic images, drawings such as those Galileo made are usually not precise enough to be of use in refining an object's orbit. In 1795, Lalande also mistook Neptune for a star. 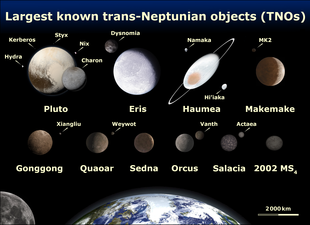 In 1690, John Flamsteed did the same with Uranus, even cataloging it as "34 Tauri". One of the most extreme cases postulated is of the discovery of Ganymede. This again involved Galileo, who is usually stated to have discovered it in 1610. It has been postulated by Xi Zezong that Ganymede was discovered by the Chinese astronomer Gan De in 365 B.C., when he catalogued it as a small red star next to Jupiter during naked eye observation. It may be noted that by apparent magnitude, Ganymede is supposedly (barely) visible with the naked eye, but it is usually lost in the glare of its parent planet. It has been postulated that a tree limb could obscure Jupiter enough for observation. This would be a precovery of nearly two thousand years, very probably the longest recorded. ^ McNaught, R. H.; Steel, D. I.; Russell, K. S.; Williams, G. V. (March 7–11, 1994). "Near-Earth Asteroids on Archival Schmidt Plates". In Jessica Chapman; Russell Cannon; Sandra Harrison; Bambang Hidayat (eds.). Proceedings, The future utilisation of Schmidt telescopes. IAU Colloquium 148. 84. Bandung, Indonesia: Astronomical Society of the Pacific. p. 170. Bibcode:1995ASPC...84..170M. ^ Villard, Ray; Lafreniere, David (April 1, 2009). "Hubble Finds Hidden Exoplanet in Archival Data". HubbleSite NewsCenter. NASA. Archived from the original on April 5, 2009. Retrieved 2009-04-03. ^ "JPL Small-Body Database Browser: 2060 Chiron (1977 UB)" (2009-09-17 last obs). Archived from the original on 2011-06-09. Retrieved 2010-02-08. ^ Fred William Price (2000). The planet observer's handbook. Cambridge University Press. p. 352. ISBN 9780521789813. Retrieved 2009-09-11. ^ Galilean Moons– Gan De. Available at http://www.mediander.com/connects/12505/galilean-moons/#!/topic/1989270/ Archived 2017-12-01 at the Wayback Machine Accessed 27th November 2017. ^ Gan De Biography. Available at "Gan de biography". Archived from the original on 2017-10-29. Retrieved 2017-11-27. . Accessed 27th November 2017. ^ "Charles Messier, premier observateur de l'astéroïde Pallas". cieletespace.fr. Archived from the original on 16 March 2016. Retrieved 7 May 2018. ^ Chamberlin, Alan. "JPL Small-Body Database Browser". ssd.jpl.nasa.gov. Archived from the original on 7 May 2018. Retrieved 7 May 2018. ^ "JPL Small-Body Database Browser: 38628 Huya (2000 EB173)" (2009-06-13 last obs). Archived from the original on 2018-05-07. Retrieved 2010-02-09. ^ "JPL Small-Body Database Browser: 28978 Ixion (2001 KX76)" (2009-05-21 last obs). Archived from the original on 2015-11-05. Retrieved 2010-02-08. ^ "JPL Small-Body Database Browser: 50000 Quaoar (2002 LM60)" (2009-09-12 last obs). Archived from the original on 2011-06-11. Retrieved 2010-02-08. ^ "JPL Small-Body Database Browser: (2002 MS4)". 2011-12-12. Archived from the original on 2012-04-15. Retrieved 2015-01-28. ^ "JPL Small-Body Database Browser: 90377 Sedna (2003 VB12)" (2010-01-05 last obs). Archived from the original on 2016-03-25. Retrieved 2010-02-08. ^ "JPL Small-Body Database Browser: 90482 Orcus (2004 DW)" (2009-04-28 last obs). Archived from the original on 2012-02-08. Retrieved 2010-02-08. ^ "JPL Small-Body Database Browser: 136108 Haumea (2003 EL61)" (2010-01-26 last obs). Archived from the original on 2011-06-09. Retrieved 2010-02-08. ^ "JPL Small-Body Database Browser: 136199 Eris (2003 UB313)" (2009-11-20 last obs). Archived from the original on 2011-05-12. Retrieved 2010-02-08. ^ "JPL Small-Body Database Browser: 136472 Makemake (2005 FY9)" (2010-01-26 last obs). Archived from the original on 2011-08-30. Retrieved 2010-02-08. ^ "JPL Small-Body Database Browser: 225088 (2007 OR10)" (2009-10-19 last obs). Archived from the original on 2012-07-01. Retrieved 2010-02-08. ^ "JPL Small-Body Database Browser: 2013 FZ27)" (2014-03-26 last obs). Retrieved 2015-04-13. ^ "JPL Small-Body Database Browser: 2015 RR245)" (2016-06-08 last obs). Archived from the original on 2016-12-27. Retrieved 2016-12-26. Look up precovery in Wiktionary, the free dictionary.